Yesterday I participated in my third JostRunning 5K [check out my recaps from August’s 5K, August’s Half, September’s 5K and a few more of my posts about JostRunning here and here if you missed them the first time around]. This month the theme is Oktoberfest. The charity that the races will benefit is Midwest Food Bank. 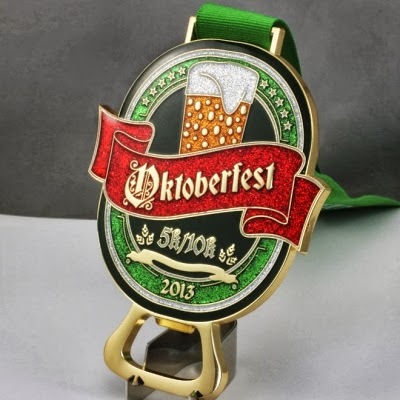 And the medal is a BOTTLE OPENER! 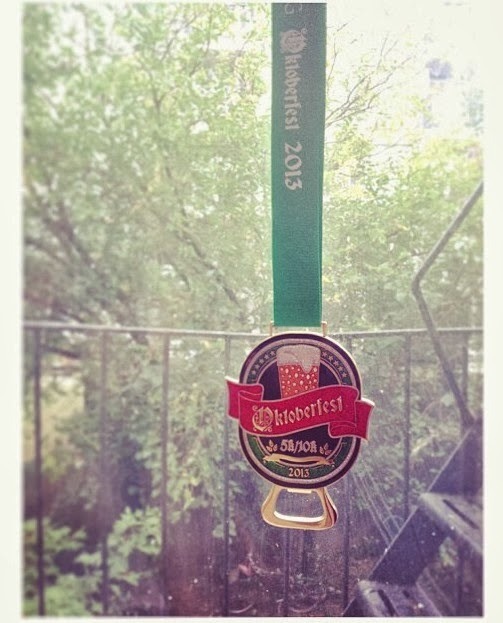 Although I don't drink beer (or even soda), so I may not take full advantage of the medal, it is still SWEET!! I decided to run down at the beach (but not ON the beach like I did for one of my Friday workouts). The Santa Ana winds were already blowing, even at 8am, so it was pretty warm and dry. Oh, how fire season makes me nervous. 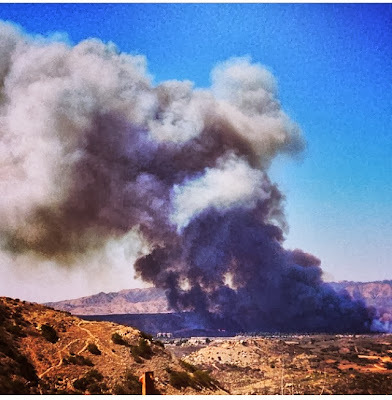 This is a picture from Jason Mraz's Instagram of the Saturday fire on Camp Pendleton. Ryan and I could see it from our house, but didn't take any pictures. My legs were still pretty tired from my previous two days of workouts [an assortment of workouts on Friday and then 19.6 miles of bike riding on Saturday], which I could definitely feel as I started. Along with the heat, I recently started on some new meds for my Fibromyalgia/ Restless Legs/ Sleeping issues – which gives me an EXTREME dry mouth. My dry mouth from the medicines, coupled with the dry and hot air made it pretty difficult to breath, but I was still able to get the run done. 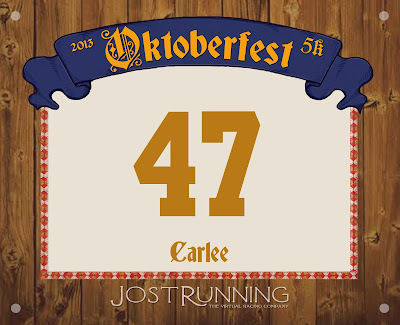 I was able to keep negative splits (meaning each mile was faster than the previous one) – the first mile was at a pace of 9:14, the second mile at 8:54, the third mile at 8:44, and the last tenth of a mile at a pace of 7:47 – which got me to cross the ‘finish line’ at 27:39. Again, not one of my best 5K times, but I think with my tired legs, lack of producing saliva, and warm temps I did pretty well! 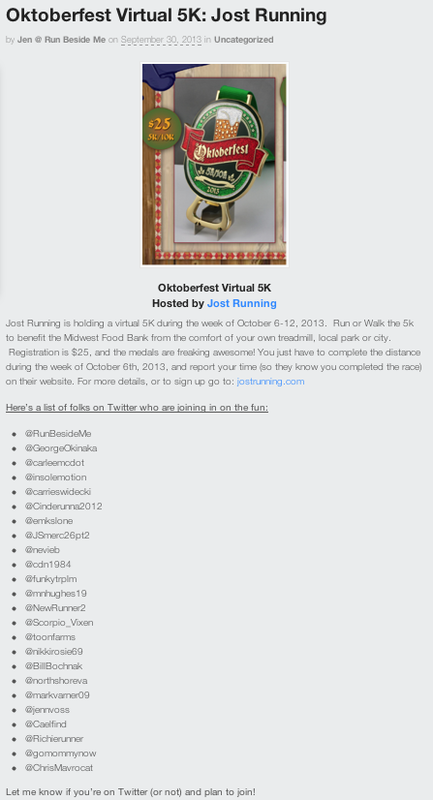 And don’t worry, it is NOT TOO LATE – you can still sign up for the Oktoberfest 5K AND YOU DON’T NEED TO BE ON TWITTER (and I even have posted a 15% off coupon code below). It looks like you had a lot of fun and your partnership with JostRunning is awesome! Congrats on finishing and I'm so glad we're all getting to run! Looks like you had a fabulous time! SMALL WORLD: we live in Fallbrook, and saw the smoke from the 15 as we were coming home from Rugged Maniac that Saturday! I ran the 5K with my husband and our Pomeranian up in Temecula! It was my first event with Jost and I can't wait for future events! Are you doing the slow your roll slow mile? We're signing up for that one next- how fun will that be!